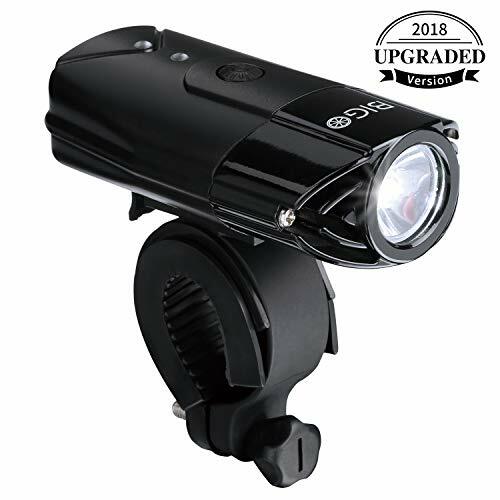 The best front bike light based on riders and users is BIGO; The best option for those riders that don’t what to save in their own security and would like to get an excellent vision of their way, as well as offering a great visibility to other drivers. ¿Why BIGO is the best front bike light? High brightness adjustable: powerful illumination of 900LM, the lighting distance reaches 90 meters. It is super bright; high / medium / intermittent. Different modes of use to meet your lighting needs. Simple water resistant control: On the smart button, lightly touch 0.6 seconds to change mode, without pressing the button. Turn on the light and choose between the three operating modes. Waterproof IP65. Easy installation: This bicycle headlight can be installed in a minute, does not need tools and is suitable for all types of bicycles. It can also be used as a portable flashlight after removing the holder. USB recharge: Built-in rechargeable lithium battery of 2000mAh. Equipped with a USB cable, it only takes 4 hours to charge the front light through any 5V charger. Apart from looking very small, which makes it quite versatile and portable, I would emphasize that it has enough power to light up a lot, as a result I can go with the mountain bike through the field at night. Especially relevant are the robust finishes in aluminum and ABS and comes with protection to withstand rain. Although it is a waterproof flashlight, it can not be submerged, that is, it is not suitable for spearfishing or other activities. The charge of the battery is quite fast and we guarantee at least 500 cycles of loading and unloading. In summary ideal for versatile use for a bike or for use at home or at home, certainly if it is for a gift the box is quite apparent and careful. Did you like what you've seen so far? Now you can buy the best front bike light directly here! 【RESISTENTE A LA AGUA】Encienda la luz y elija entre los tres modos de funcionamiento: fuerte(2-3 horas), suave(5-6 horas) y parpadeante(5-6 horas). La prueba de agua IP65 es para conducir con seguridad bajo la lluvia con el peor clima.